It's back! Thanks media! I'm starting to think that a re-install after backup might not be a bad idea. Added HDR10 and Dolby Vision under Format, for those of you who are into 4K. - Export files can now be dragged and dropped into ProfilerQuery to open them. - The Tools menu has a new menu item: Export collection. If you use ProfilerQuery regularly, you have probably created a command file to help export your collection. If you haven't, see the ProfilerQuery help file for instructions. It's easy. Now it is even easier to export your collection. You just have to specify your command file in the Settings in ProfilerQuery, and then you can just select Tools/Export collection and ProfilerQuery will send the necessary keystrokes to DVD Profiler to run your command file. 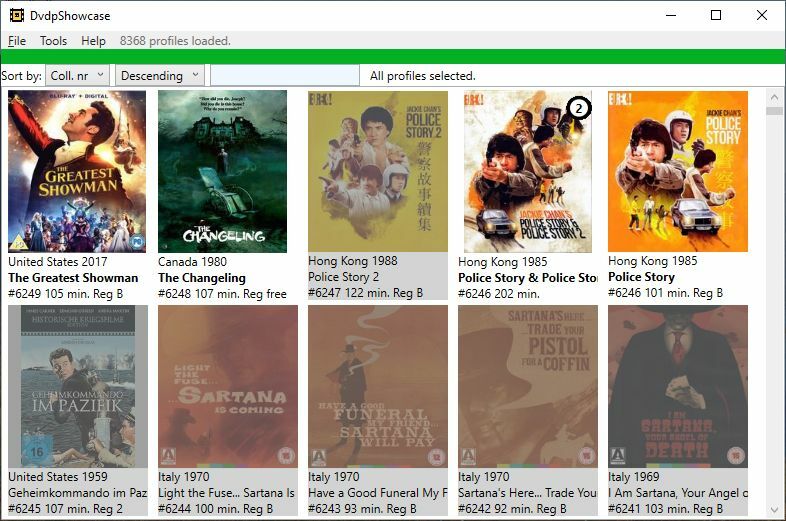 NOTE: If you are using a translated version of DVD Profiler, there are a couple of registry entries that need to be modified. PM me and tell me which translation you are using, and I'll help you fix it. WhenI try something that's new to me in programming - new techniques, new components, etc - I often write a small test project to see if it works and is suitable for whatever I have in mind. These test projects usually gets scrapped when I am done. I wasn't pleased with the Showcase tab in ProfilerQuery, but at the time I didn't know how to make it more like the Showcase in iOS Profiler for iPad. But recently I found a component that seemed to fit the bill. So I wrote a test program. But when I was done I thought "Yeah, that's nice, but it over 1000 lines of code. ProfilerQuery is already complicated. Do I really want to add all this. And it's a fair bit of work adapting the test code into PQ." Want to try it for yourself? Here it is. As it stands, you don't have a whole lot of options to select profiles. You can load flags from DVD Profiler, so you can run queries in ProfilerQuery, save the result as flags, and then load them in this program. It would obviously be a lot easier to have it inside ProfilerQuery. I currently still consider DvdpShowcase a test program. I offer no support for it, and no promise of any further development. Do you think that this functionality should be incorporated into ProfilerQuery? If so, let me know! No comments (just one greenie), so I guess the improved showcase is not something that I need to put any work into. Not totally unexpected, but a little disappointing. So this test is now abandoned. Two comparison criteria (and output fields) added; Is Combo Set and Has Bonus Feature. If a profile has more than one media type, it is considered a combo set. If a profile has one media type and one child profile, it is considered to have a bonus feature. Note: Profiles of the above types will no longer be flagged as boxset parents. This is a change from previous functionality! Their child profiles will still be flagged as boxset children, though. This change has been made to make it possible to separate "real" boxsets from combos and profiles with bonus features. 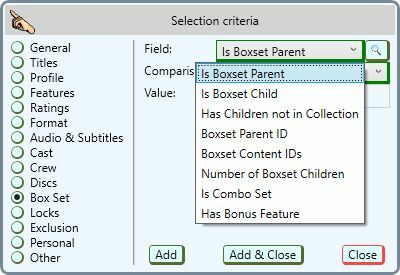 Limitation: If a profile contains more than one bonus feature child, it is still flagged as a boxset parent. Fixed a minor bug. Profiles with bonus features were mistakenly still flagged as boxset parents.